A superb villa in a prime location with all amenities on hand. Casa Troy consists of 5 spacious bedrooms, with 2 smaller twin rooms located just off the two super king rooms on the lower level, all with fans to keep you cool during those warm nights, also available is air con and heating coin operated if required. Three rooms have super king beds, three have twin beds and one has bunk beds. The twin rooms that lead off from the downstairs bedrooms are only left open when the villa is operating at full capacity. There are 4 full sized bathrooms, three with twin sinks and large showers, one with a bath with shower over the bath, 3 are also en-suite bathrooms. This modern tastefully designed villa is light and spacious and would be ideal for large families and groups of friends. Satellite tv with 60" flat screen TV including all sky sports and movies, a games console. Free Wifi is included. The villa has a fully equipped modern kitchen with granite surfaces and a separate utility room/drying area. Relax and enjoy the private south facing sun terraces furnished with comfortable sun loungers, pool table and a large hot tub Jacuzzi soothing away any feelings of stress with hydro air massage. Enjoy a swim in the full sized electricity heated salt water pool (heated all year) and later dine by moonlight on the outside dining area providing that special 'al fresco' experience. Bathroom 1- en-suite to master bedroom, shower and twin sinks. Bathrooms 2 and 3 both en suite, shower and twin sinks. Bathroom 4 Full bathroom, bath with shower, sink. All fully tiled. Linens are changed weekly on a minimum 14 night stay. You will find available parking outside the villa, however the drive is for pedestrian access to the villa only. The spacious lounge area is bright and welcoming with a 60" Flat screen TV. inclusive of all sky sports channels and movies..etc , games console. Casa Troy has a luxury fitted kitchen with granite work surfaces, fully equipped with fridge-freezer, full size oven and hob, dishwasher, washing machine and microwave. Crockery and cooking utensils. Just 2 minutes drive from the villa is the islands newest 18-hole golf course making this the second course on the island of Lanzarote. The established 18 hole golf course is situated in Costa Teguise a 25 minute car journey away. Notes on accommodation: This spacious villa is tastefully decorated to a high standard and has 7 bedrooms, 4 full bathrooms (the 3 king size bedrooms are en-suite shower enclosures and twin sinks) hairdryers also supplied. Two bedrooms are furnished with 2 twin beds. All bedrooms have wardrobes. The lounge and dining areas are bright and airy and comfortably seat 14 guests. Cot and highchair can be provided upon request. Complimentary welcome pack on arrival. Outside: On the private south facing terraces you will find a full sized solar and electrically heated pool, comfortable sun beds and leading from the terrace is the BBQ and dining area providing that 'al fresco' dining experience. Enjoy a game of American pool or immerse yourself in your own large warm water therapeutic spa hot tub combining an experience that is both rejuvenating and healing, whilst washing away muscle and joint stress with hydro massage jets. The gardens are mature and well cared for and provide additional privacy. Utility Room: The separate utility room is spacious and equipped with iron and ironing board and has an ample drying area. Cleaning / Towels / Linen: Bath, hand towels and bed linen are changed weekly on all stays over 14 nights, pool towels are provided for your use during your holiday. For stays under 14 nights towel and linen changes can be provided at extra cost. Please enquire with the owner. Lanzarote, the sun-kissed easterly island of the Canaries is claimed to be the most exclusive. The climate is dominated by North Eastern trade winds and the warm Gulf stream producing glorious summer temperatures all year round. The main resort is in the centre of the island and the most popular resort being Puerto Del Carmen with over 5km of golden sands, rocky divides and palm trees. Just a short walk from the hustle and bustle of central Puerto Del Carmen, Casa Troy can be found. We can recommend car hire companies to you if you would like to rent a car during your holiday in Lanzarote. Vehicles can be collected and returned to airport. Please email for more details. 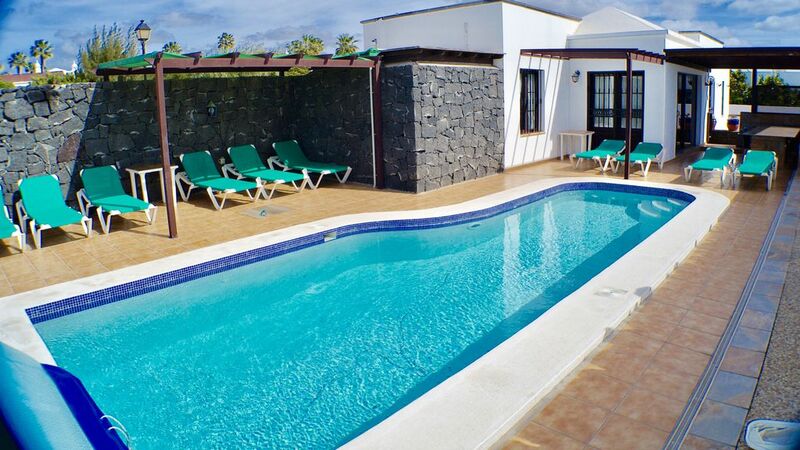 Casa Troy is ideally situated in an exclusive area of Puerto del Carmen. Take a leisurely stroll from the villa and you will find a sandy cove ideal for snorkelling, swimming and scuba diving. Continue along the coastal path to the delightful, picturesque old town with its amazing variety of quality local and international restaurants, bars, supermarkets and the Biosfera shopping centre. Do not miss our fabulous Marina at Puerto Calero, just 3km away. Local sports include golf, sailing, scuba diving, waterskiing, climbing, windsurfing, cycling, tennis, hang-gliding, walking, parascending, horse riding, jet ski, go-karting, aqua park, sports complex, trekking, snorkelling, swimming, bird watching, flora and fauna, deep sea fishing to name but a few! Booking Notes: Tariff: Rates are for up to 4 persons staying in the villa. There is a charge of £135.00 (£150.00 from July 2018) for every extra person per week, up to 14. Christmas and New Year set at one price of £2600.00 per week for up to 12 people. Each extra guest is £150.00. A £300 per week non refundable booking deposit is payable on confirmation of bookings. Balance to be paid 8 weeks prior to departure. Security deposits are also taken against damages & refunded at the end of guests' holiday. Please read terms and conditions. Changeover Day: Bookings are from 14.00 hrs on day of arrival to 10.00 on the day of departure. However depending on other guests we can be flexible on arrival and departure times. Late checkout fee applies. Please note that all guests should have holiday insurance. Notes on prices: Please see Booking notes for details on the pricing tariffs, deposits etc. All payments are accepted by way of bank transfer, either into the owner's sterling account or spanish euro account or via Paypal. Prices are listed in GBP, but can be converted to euros if guests would prefer to pay in euros. Late check out and early check in will be offered if available at the cost of £10.00 per guest or £100.00 as a minimum .